Don’t let the Inland Steel Building fool you. It’s an architectural giant disguised as a modest office building. Architects and architecture buffs have admired the sophisticated, Mid-Century Modern design of this Chicago classic for generations. 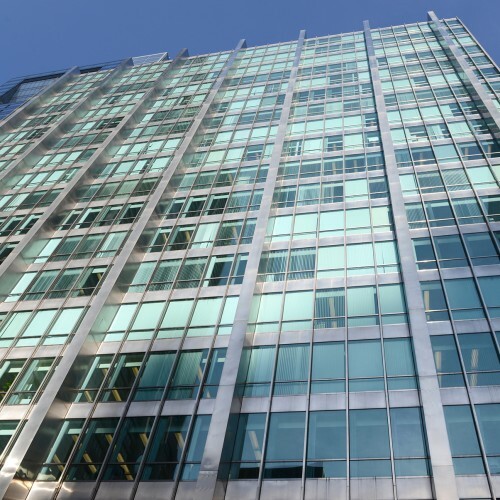 The 19-story office tower’s sleek facade combines shimmering aquamarine glass and stainless steel. Its innovative use of the metal pays homage to the building's namesake, the Inland Steel Company. Founded in Chicago in 1893, the company grew to become the eighth-largest steel producer in the United States by the 1950s. 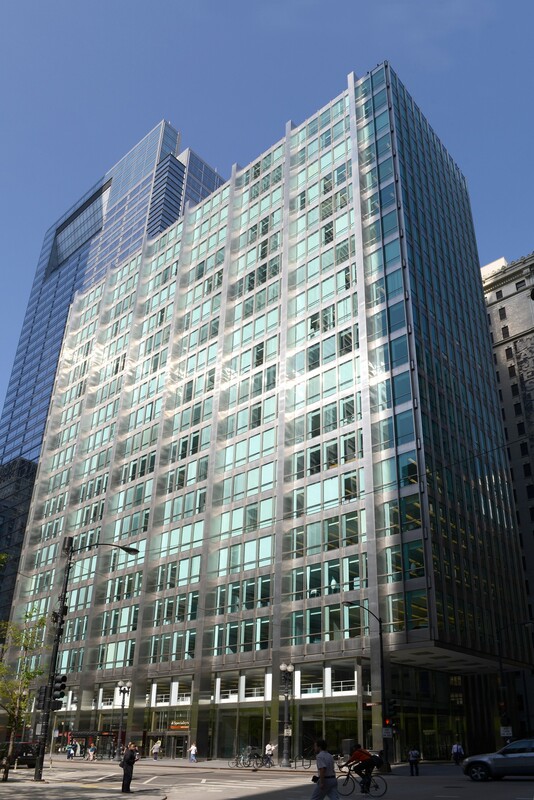 To celebrate this success, Inland Steel commissioned a new corporate headquarters in Chicago's Loop in 1954. They wanted a building with a modern design to highlight the enduring power of the steel industry and showcase their product as well as other postwar technologies. 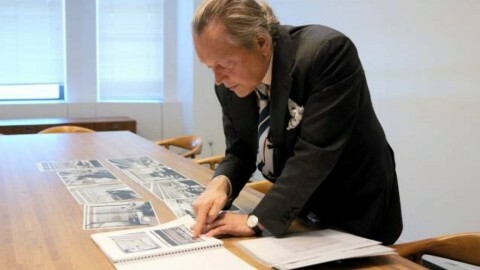 Architects Walter Netsch and Bruce Graham of Skidmore, Owings & Merrill obliged. 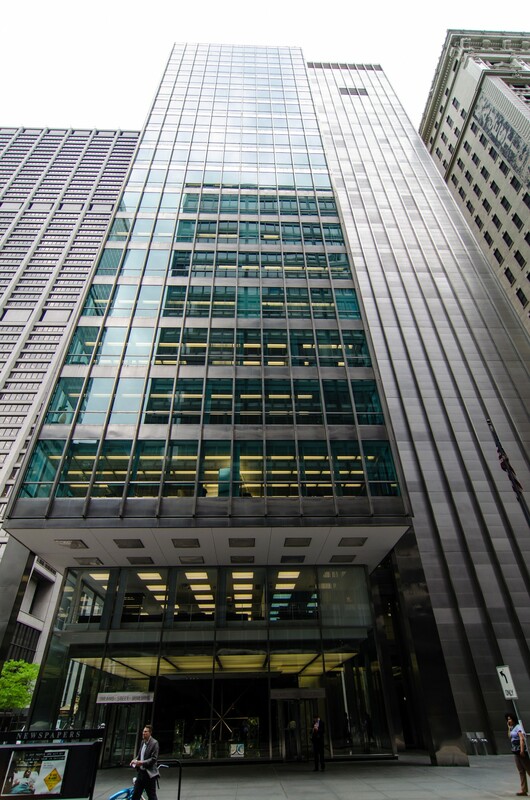 Because Inland Steel was producing carbon steel almost exclusively at the time of the construction, the stainless steel for the building had to be purchased from another steel company. 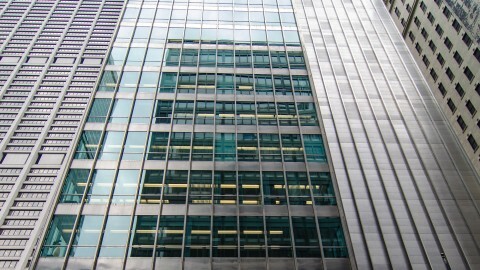 Inland Steel’s office and service towers are visually linked by the same pattern of vertical and horizontal lines. The security desk inside the building’s lobby was designed by Frank Gehry. 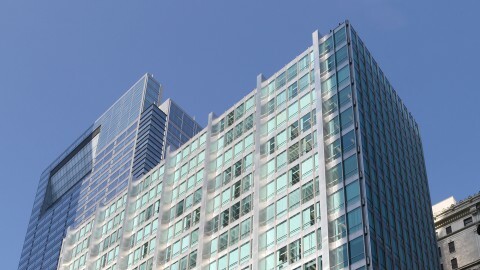 It weighs 14,000 pounds and is made of emerald-colored glass that references the building’s tinted exterior windows. 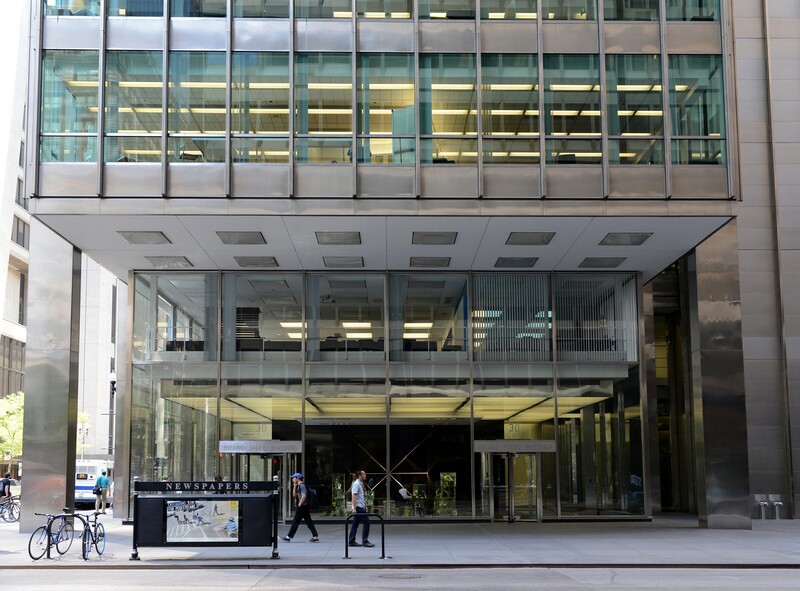 DeStefano Keating + Partners, the architects of neighboring building One South Dearborn, had such reverence for the Inland Steel building that they set their building back on its site to provide a glimpse at Inland Steel’s northern facade. 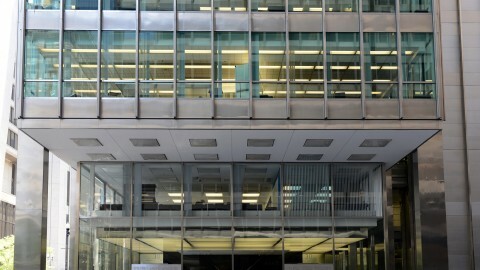 Inland Steel’s column-free interior demonstrates the Miesian design concept of universal space. Each level boasts 177 feet by 58 feet of unobstructed, usable space. This open plan aesthetic was truly innovative at the time of the building’s completion. It provided unmatched, flexible square footage to tenants. The clear-span construction is made possible by 14 exterior supporting columns, 60-foot girders and an adjacent 25-story service tower. 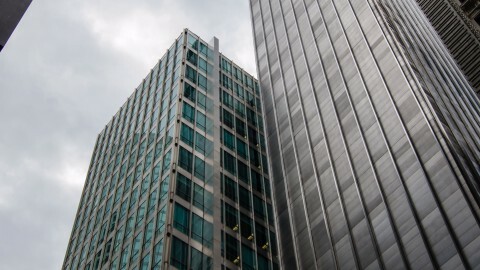 The windowless tower, also clad in stainless steel, separates operational support from the professional offices. It is home to the building's essential systems including its lavatories, seven elevators, staircases and vertical circulation. 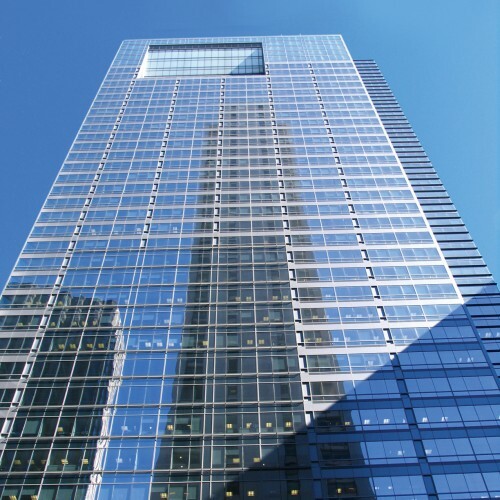 The wide-open floor plan of the Inland Steel office tower is partly responsible for the building’s enduring popularity. Today, inhabitants are still able to adapt the space to accommodate their specific needs. The Inland Steel Building shines in the Loop like emeralds set in platinum. 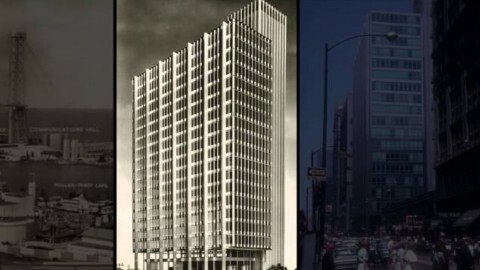 Imagine what people thought in 1958, when this glass and steel masterpiece emerged among buildings designed in historic styles! 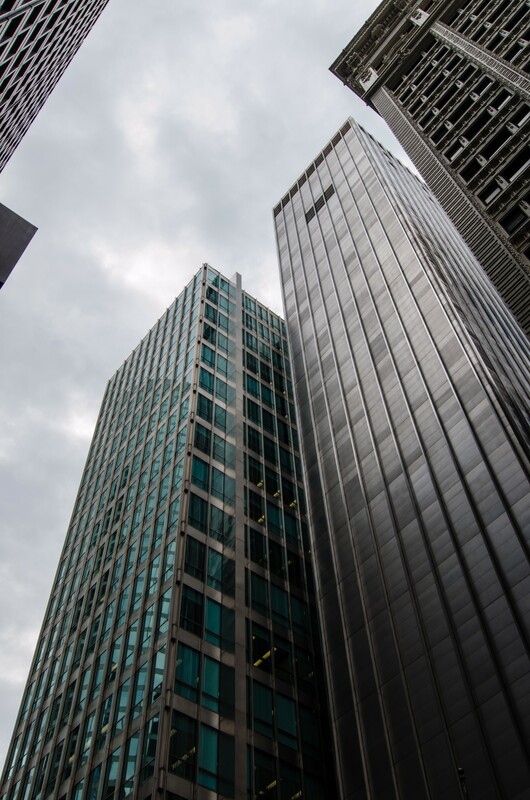 When completed in 1958, Inland Steel was the first building constructed in Chicago's Loop in more than 20 years. 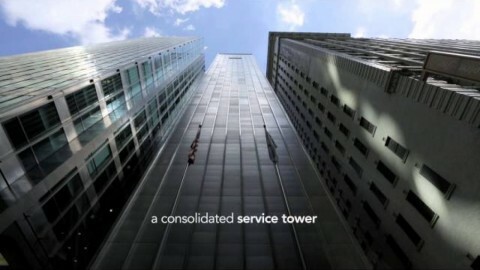 Its sleek sophisticated design ushered in a new era of modernity in the city. The primarily glass facade is completely devoid of ornamentation. 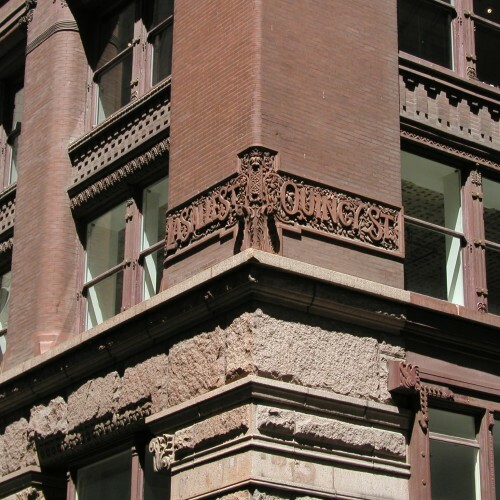 This must have been a surprising change for Chicagoans accustomed to the richly ornamented terra cotta, brick and stone facades of the past. The office tower seemingly floats above its glass-enclosed, transparent lobby—staying true to a Mid-Century Modern aesthetic. Housed inside the lobby is Radiant I, an abstract, contemporary sculpture. Artist Richard Lippold was commissioned by the Inland Steel Company to create a work specifically for the space. Composed of metal rods and wires, it spans a shallow reflecting pool. 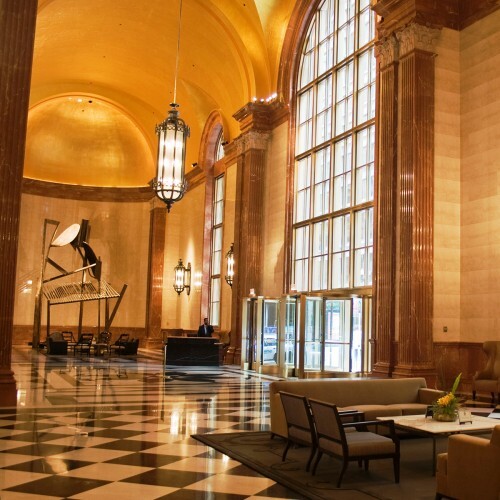 The lobby’s open aesthetic allows a privately-owned work of art to be experienced and appreciated by the public. The Inland Steel building’s elegant design has aged well. Many of our tour guests are surprised to discover that it's much older than it appears. It was a pioneer in the mid-20th century, and its design remains fresh and current today.